The Humberside Police force has moved off the bottom of an unofficial league table thanks to "major improvements" in performance, the Home Office has said. But it remains in the bottom six of the 43 forces in England and Wales, scoring seven out of a possible 21 in ratings by HM Inspectorate of Constabulary. Last year, Humberside came joint last with Northamptonshire on three points. In the most recent review its handling of violent crime was rated "poor", but it had improved in other areas. It was rated "good" and "fair" in most categories. The Home Office said the upturn had been brought about by "a more robust performance management structure". Its annual performance assessment report said there had been "substantial improvement" in the three areas that were graded "poor" last year. "Compared with the previous year, force performance has improved in several areas. 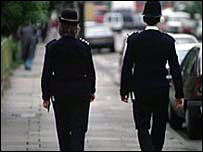 "Total crime has fallen, as have domestic burglary and vehicle crime. "Although violent crime has increased, so has the detection rate. The number of offenders brought to justice has also risen by nearly 10%. "Of particular note were improvements in the detection rate for all crime, satisfaction levels among victims of racist incidents and the level of acquisitive crime." Bedfordshire, which notched up just one point, was this year's worst-performing police force. Meanwhile, Surrey and Lancashire were joint top of the table.